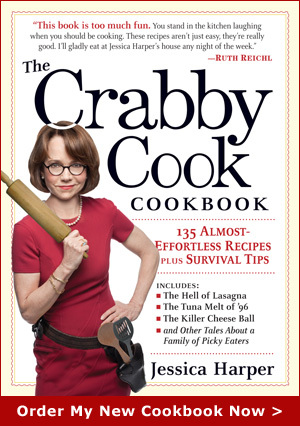 The Crabby Cook – Jessica Harper» Blog Archive » Cookie Crisis Contest! I’m having a cookie crisis. Next week is, of course, the week when every Christmas-oriented cook in America will bake cookies like a madman. I was invited to a cookie exchange party, a luncheon to which you bring home-baked holiday cookies, and then everyone gets to take home some of the other guests’ goods. I love this idea, so festive and holiday-ish, so I signed right up. It’s just dawned on me that now I have to bake cookies, which is something I never do except when my children are having a chocolate chip emergency. I need to find a recipe, fast, that is easy enough for a lame-o like me and significant enough to be a worthy entry at the luncheon. In my mind I see these ladies showing up with perfect squads of gingerbread men decorated in ways that require two years of training at a culinary academy, while I am skulking in the corner trying to pretend I did not bring the sad platter of scrappy, M&M-dotted, Big Fat Loser cookies that everyone knows I brought. Please hurry or I will have to call my therapist. This entry was posted on Friday, December 12th, 2008 at 12:01 pm	and is filed under Just Desserts, Recipes. You can follow any responses to this entry through the RSS 2.0 feed. You can leave a response, or trackback from your own site. I just made a batch of these for my Dad and sent them to him for his birthday, if I hadnâ€™t sent them we would have eaten them up. They are really EASY to make. 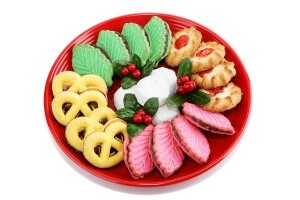 If this recipe isnâ€™t to your liking there is always Martha Stewartâ€™s Holiday Cookies website which is full of good ideas. Also try http://www.recipesource.com the Searchable Online Archive of Recipes. Okay here we go. well after each addition. Chill 2 hours or overnight. about 5-8 days after baking. Okay, so I made a quick call to mom to ask, â€œWhat is a favorite holiday cookie that you make that is virtually fool-proof and requires no decoration?â€ She didnâ€™t hesitate a second, coming up with Refrigerator Cookies. She added, â€œIf you want to get fancy, make the checkerboard ones.â€ So, if an effort to help you avoid the pangs of BFLC (Big Fat Loser Cookie) syndrome, I humbly submit the recipe for Beckyâ€™s Refrigerator Cookies. Mix well. For white cookies, add 2 tsp cinnamon or nutmeg to dough, whichever you prefer. For chocolate cookies, add 4 sq melted unsweetened chocolate. To get really fancy, you can cut each chilled roll in 4 lengthwise slices, and put 2 white and 2 chocolate together like a checkerboard, then re-roll and chill. When chilled, cut in Â¼ â€œslices (slightly thicker if you like softer cookies) and bake at 400 degrees for 6-8 minutes. Jessica – try the Betty Crocker recipe Iâ€™ve linked to. Iâ€™ve made it twice now and not only is it incredibly easy, everyone whoâ€™s tried a bar loves them and has at least 2 more! (1) make a savory cookie, which no one else will think of. how bout the stilton & walnut slice and bake ones i gave ya last night?? (2) buy a roll of pillsbury sugar cookie dough. cut it into very thin slices. sandwich an andres chocolate mint (the ones wrapped in green foil) between two slices and bake according to directions on dough wrapper. delish and no one will know you used store-bought dough! Preheat oven to 400Â°F. Spray 2 large baking sheets with nonstick spray. Melt 1 cup chocolate chips in glass bowl in microwave, stirring twice, about 2 minutes. Cool slightly. Okay, I canâ€™t wait to try all of these! Keep â€˜em coming! My neighbor in Florida, Mary Ann says go to any supermarket (on shelf where they sell raisins) and buy NONE SUCH MINCEMEAT. It comes in a box. Follow the recipe. Very very simple. Even if you never eat the cookies, the house will smell fantastic and oh so Christmasy! Haha, I could have asked my friend Elena. She started a Cookie Club on my suggestion (I am member 001) for friends and cookie lovers here in Madrid. She makes a terrific lemon cake too. Sadly she went to Asturias in the Norht of Spain this winter, so we never had that cookie exchange party we thougt of as well. Hopefully sheÂ´ll be back soon, picnic season has officially started.